There's a lot you can do to shake things up for Valentine's Day in Las Vegas. You can take your date to watch a volcano explode or shop at CVS, but the best way to keep hearts happy is with a great meal. 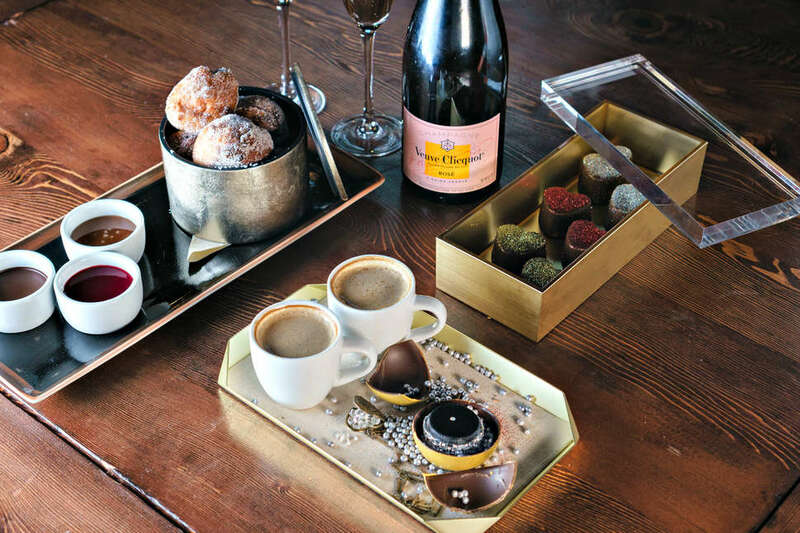 So scope out the most romantic restaurants in Las Vegas, book a reservation, and make this Valentine's Day (or any day you decide to make a trip) extra sweet in Sin City. The Barrymore is one of the best reasons to venture towards the often-neglected North end of the Strip. The menu features prime bone-in steaks and pan-seared foie gras, but the real romance blossoms when you enjoy a drink before your meal near the long fire pit on the patio. This French steakhouse has an American touch, with wild prawns from California and three-pound grilled lobsters from Maine, but make sure you enjoy some selections from the oyster bar. 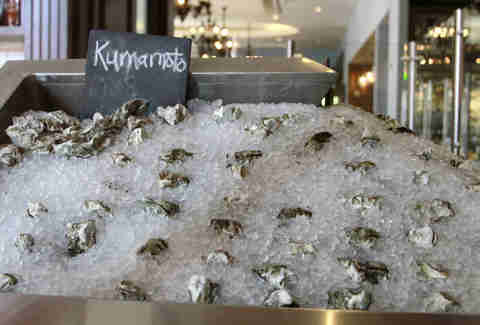 If oysters aren't your speed, have no fear; any of the steaks grilled under the restaurant's 1200-degree broiler will do just fine. 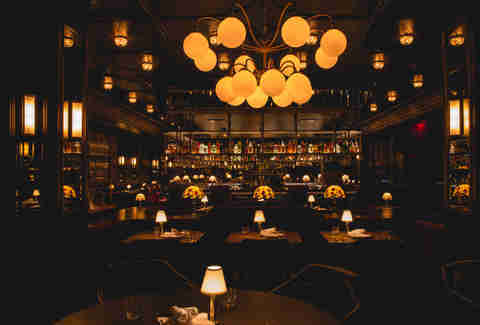 The atmosphere is cozy and intimate with just 50 seats and plenty of plush red furniture. Browse through the “his and hers” menus while sitting underneath the rose-budded glass ceiling that has been a staple of the restaurant for more than 20 years -- dating back to its days at the old Barbary Coast casino on the Strip before moving to South Point. This spot is quiet and intimate and perfect if you want to spend quality time with your date. Gaze into each other’s eyes, or gaze out the window where Las Vegas Boulevard meets Flamingo, while enjoying a long multi-course dinner prepared and served by a team that is so precise and knowledgeable, it’s like your meal was engineered instead of merely cooked. You won't see any flowers or other aromatics except the food. 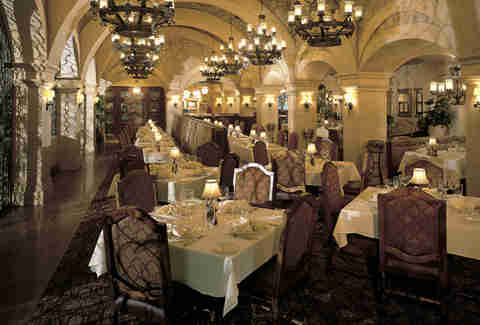 The best opportunity for romance in Henderson can be found here, where you'll feel like you're in a Napa wine cellar. Many of the servers have been around for more than 10 years and specialize in tableside presentations that include spinach salad, cherries jubilee, bananas foster, and flaming coffee. This intimate spot from Chef José Andrés is tucked away in a small private room and set against a dramatic red wall and red velvet curtain. You’ll be blinded by love and science alike, with an evening of Spanish cuisine made with molecular gastronomy. Cleo has a deeply diverse Mediterranean menu that goes far beyond the expected hummus and lamb. Enjoy the grilled octopus and potatoes near the hustle of the main floor, or share the kale flatbread in one of several private dining areas. The night begins with a red rose for your date and a cozy old-school atmosphere that makes you feel miles away from the chaos of Fremont Street upstairs. The house salad is prepared with a table-side cart. Pick out your ingredients together, and sink your teeth into anything. Reservations definitely recommended. It’s hard to believe that this restaurant is just steps off the casino floor of the MGM Grand. 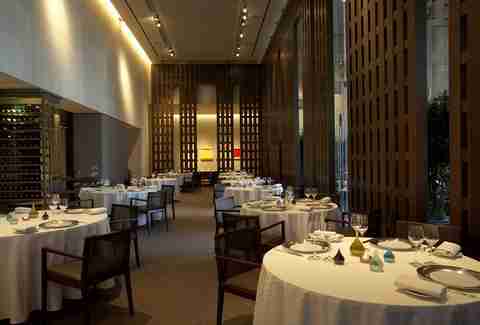 It’s almost like walking into the dining room of a private mansion, but it's actually the only proper full restaurant in the Western Hemisphere from acclaimed French chef Joël Robuchon… unless you count the more casual, budget-friendly L'Atelier de Joël Robuchon next door. Beauty & Essex overflows with style and energy, including a lounge area perfect for cocktails before moving on to a table in one of several dining rooms. 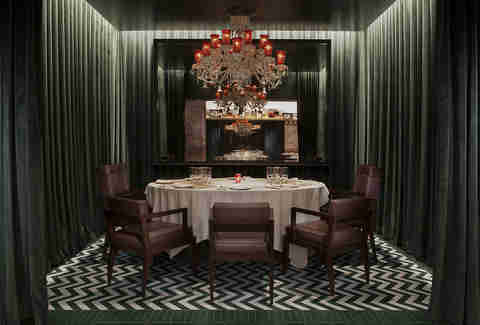 The gold decor is designed to mimic a jewelry box and the food is meant for sharing, especially the 40-day dry-aged Tomahawk rib-eye. The pawn shop near the host stand may seem a bit odd, but makes for a good conversation piece when struggling through an awkward first date. 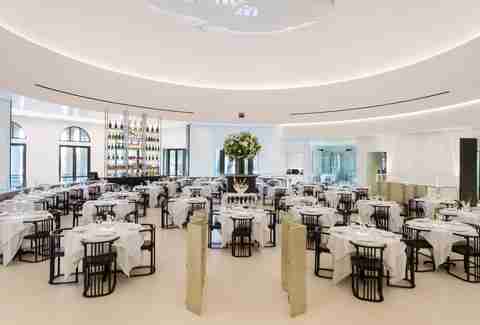 The only US restaurant by French chef Pierre Gagnaire is clearly designed to be "an experience" from beginning to end -- from the broken eggshell design of the plates and floating overhead lights to the stunning floor-to-ceiling window views of the Strip. The seasonal tasting menus vary in price, but are worth every dollar for the quality of ingredients and inventive flavor combinations. 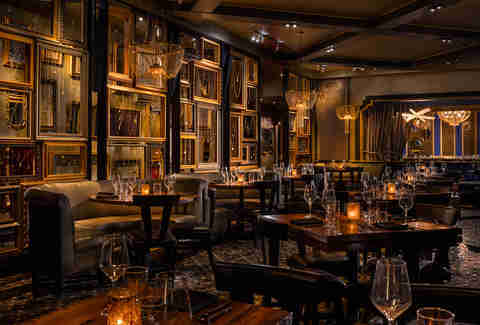 As the Monte Carlo continues its slow transformation into the Park MGM, Bavette's is the most promising example of the improvements already in the works. Opening at the tail end of 2017, this Chicago-style steakhouse is dark, moody and the kind of place where you can get close to your date in a comfortable circular booth with little disturbance. Start things off by sharing the duck and goat cheese terrine… then choose your red meat from there. 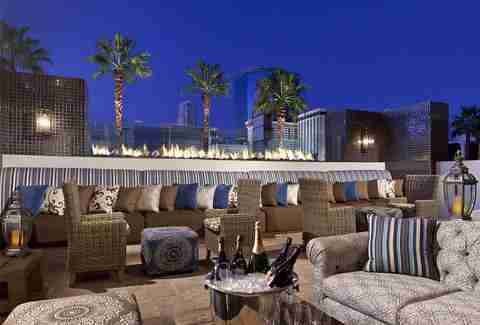 After conquering cities like London and Beverly Hills, Mr Chow found a home in Las Vegas at Caesars Palace. Take a private elevator upstairs to what feels like the "restaurant of the future" -- a dining room with all white decor and a kinetic sculpture in the center of the ceiling that moves around whenever it seems to feel like it. But what really makes this a romantic dinner destination is the crispy Gambler's Duck, the Champagne cart that roams between tables, and the bar hidden in the back that overlooks the Garden of the God swimming pool. 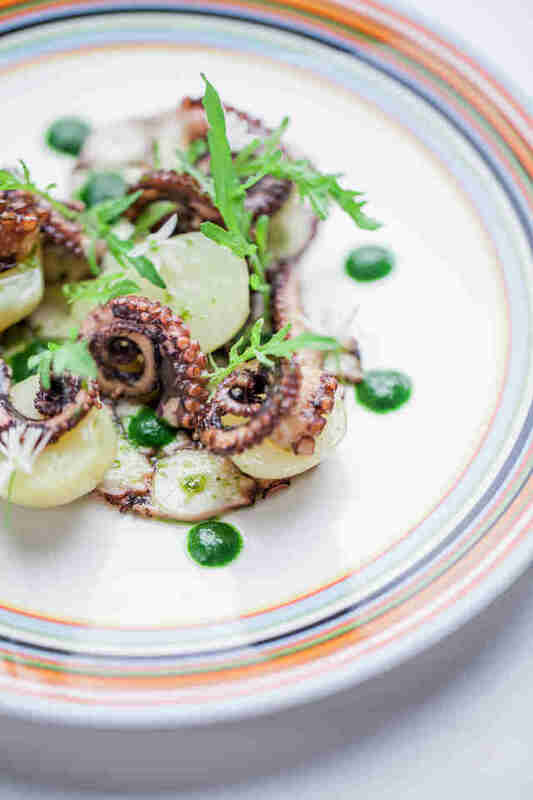 The cuisine by Alain Ducasse borrows inspiration from the coastal shores of France and Italy, but your mind will be strictly focused on the beauty and scope of Las Vegas. 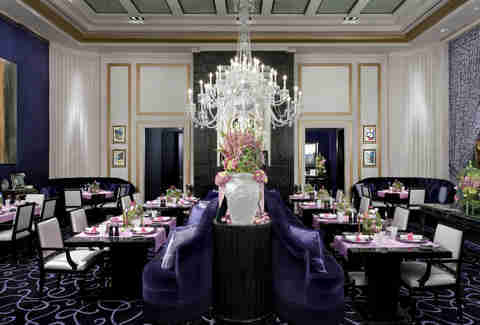 That's because the dining room sits at the very top of the Delano resort. We're talking 64 stories high -- enough to soak in the entire Strip from the south end. Request a seat on the open-air balcony and enjoy the desert breeze while chowing down on marinated sea bass and house-made pasta. Jean-Georges Vongerichten isn't trying to reinvent the wheel with Prime, but the European chef has delivered a classic American steakhouse with preparation and service that's rare among even the best fine dining restaurants. The main room is an elegant combination of Tiffany blue drapes, dark wood, and commissioned artwork, but request a table on the outdoor patio. 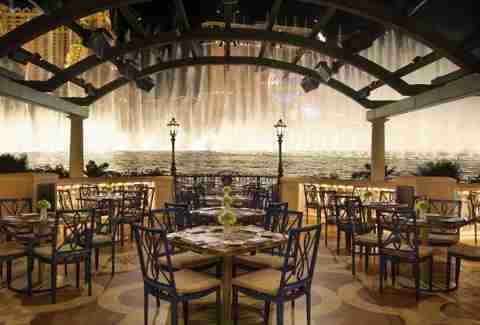 That's where you can enjoy your steak, caviar, and red wine with a full view of the Bellagio fountains.